The module will aggregate certain user activity across the site including news and forum posts, replies, comments, likes and calendar entries onto the Activity Wall. To see the activity of other users you can start following people via their profile page accessible from the staff directory. Site Administrators can also select the all-follow-all option, this means all users will see every post, please note - users cannot unfollow each other when this setting has been applied. This setting can be found in the Module Settings area. 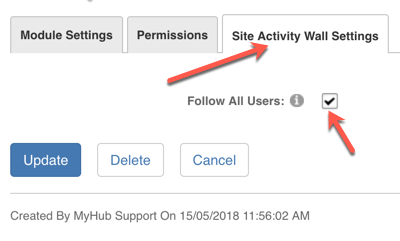 User permissions will apply so if you post news or a forum reply on a secure page the user won't see this activity unless they have access to the page. To add the module, simply drag it onto a page, no other setup is required by the site administrator or the user.